Glen Eagle is a private, bundled golf community located at the junction of Davis Boulevard and County Barn Road in Naples. Glen Eagle is accessible from either Exit 101 or 105 on Interstate 75 and has gated entrances on Davis Boulevard to the south and Radio Road to the north. The term “bundled golf community” typically indicates that golfing privileges come with ownership. That is, there are no extra initiation or membership fees. Residents of bundled golf communities also pay no greens fees. They may, however, be required to pay a nominal annual dining fee and cart fees. To distinguish even more, “bundled golf communities” in the Naples area are designed with “good golfers” in mind. Good golfers residents who like to play golf occasionally or regularly, but for whom it is not one of their primary reasons for living in the community. The concept of bundled communities was developed to offer the greatest possible value for the lowest possible cost. Glen Eagle offers both golf and social memberships. The golf course itself a Gordon Lewis design that features specially designed, multiple tee placements that make that change the length of the 18-hole, par-70 course from as short as 4,300 yards to as long as 5,600. The Pro Shop is open daily and has high-quality rental clubs available for the good, but less frequent golfers. Glen Eagle subdivisions include luxury, single-family homes and condominiums within a setting that offers the easy-going Florida lifestyle that newcomers want, and residents enjoy in Southwest Florida. Glen Eagle’s neighborhoods (including the original Glen Eagle neighborhood) are the epitome of the Naples lifestyle – unique floor plans and lot placements that provide a relaxed and serene environment. Neighborhoods include Brittany Place, Chatham Square, Glenmoor Greens, Montclair Park Villas, Saratoga Colony, and the subdivisions of Sterling Lakes and Sterling Lakes II. Other neighborhoods – Addison Reserve, Montclair Park, and the newest, Lago Villagio – feature single-family homes in a wide variety of floor plans and square footages. Lago Villagio has more than 100 modern homes that range in size from 1,800 to 3,100 square feet with Mediterranean-style exteriors. Home are available from two to five bedrooms. 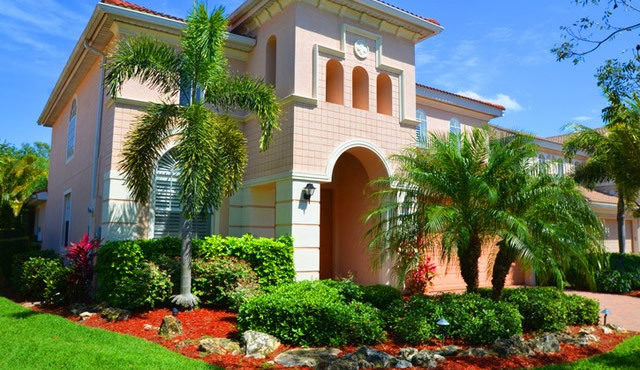 Single-family homes in the quiet neighborhood of Addison Reserve continue the Mediterranean theme that is so popular in the Naples area. Homes are available with two, three and four bedrooms, within up to 2,100 square feet. Montclair Park is home to two, three, and four-bedroom, attached villas, each with a two-car garage. The luxury villas range in size from 1,300 to 1,900 square feet. Most are located along Marblehead Way. The neighborhood has a private pool. Brittany Place villas are two-bedroom, two-bath plus den with two-car attached garage. Floor plans begin at 1,600 square feet. Sterling Lakes and Sterling Lakes II are comprised of furnished, low rise condos. Sterling Lakes condos are three-bedroom, two-bath, ranging from 1,400 to more than 1,600 square feet. The condos in Sterling Lakes II are two-bedroom, two-bath, but are slightly larger, averaging more than 1,700 square feet. The 1,300 square foot, two and three-bedroom, two bath condos of Saratoga Colony are situated in an intimate neighborhood of two-story buildings near Glen Eagles’ four Har-Tru tennis courts. Glenmoor Greens combines condos and two-story coach homes with living areas from 1,100 square feet and up in the condos and from 1,500 to 2,000 square feet in the coach homes. Residents of Glenmoor Greens have access to two private swimming pools and tennis courts. Montclair Park Villas range in size from 1,300 to 1,900 square feet and are available in two, three and four-bedroom floor plans and include a two-car garage. Chatham Square is a neighborhood of low-rise, three-bedroom, two-bath condos with access to incredible golf course views. Chatham Square condos feature high ceilings and floor plans designed around a great room. Glen Eagle is affordable living with all of the amenities of higher-priced communities. Plus, all of the rest that Naples and Southwest Florida offers is included at no extra charge.